Ryan Roberts performed on Show 291, recorded June 2014, at the age of 17. 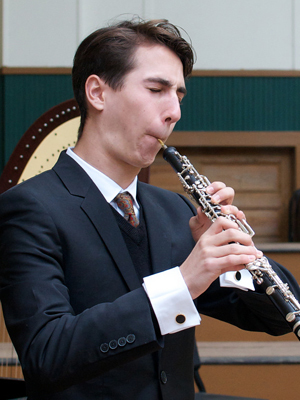 Ryan Roberts (oboe), 17, is from Santa Monica, California, where he is a senior at Santa Monica High School. He studies privately with David Weiss. He attended Idyllwild Summer Institute from 2009 to 2011. In 2013, he received a YoungArts Honorable Mention, and was invited to perform at YoungArts LA. In the summer of 2013, he toured internationally with the National Youth Orchestra of the United States of America with Conductor Valery Gergiev and soloist Joshua Bell. He is a principal with the Colburn Youth Orchestra at the Colburn School and has also performed with their Honors Woodwind Quintet. In addition to music, he is an avid photographer and also designs websites.